Few companies that entered the UK DVD market launched with as impressive a collection of discs as these four from Pathé. Not only did some of their initial releases boast anamorphic 16:9 enhancement, but they also featured – gasp! – bonus materials missing from their US equivalents. If you can live with four seconds of BBFC cuts, then Pathé’s Judge Dredd disc is another winner. The 1995 film is presented in it’s original widescreen (2.35:1) format, but, like the R1 version, isn’t 16:9 enhanced. The Pathé disc scores, though, with another snazzy menu system, rather like the Ghostbusters one, a theatrical trailer, and a twenty-minute behind the scenes feature, Stallone’s Law – The Making of Judge Dredd, (itself the victim of twelve seconds of BBFC cuts). The film, about a rigidly self-disciplined futuristic cop accused of treachery, disappointed most fans of the long-running comic strip it was based on, but is a lot of fun taken in isolation. The film’s bombastic sound mix showcases an excellent score by Alan Silvestri, presented in 5.1 sound, and the stunning production design and special effects work almost entirely succeeds in recreating the epic scope and grandeur of the strip. There’s a cruel streak running through the work of Roald Dahl that James and the Giant Peach gleefully mines. The film, a follow-up to the sublime Nightmare Before Christmas, blends live action footage, featuring Joanna Lumley and Miriam Margolies as the spiteful aunts of our eponymous orphan hero, with extensive, and highly stylised, stop-motion sequences, as James embarks on a series of improbable adventures. Pathé’s new disc is another winner. Enhanced for 16:9 sets, the disc also has a 5.1 sound mix that makes the most of the hyper-realistic atmospheres afforded by the unreal landscapes. The disc contains a video of Randy Newman singing “Good News”, a theatrical trailer and a five-minute behind the scenes featurette. These extras are of questionable quality, (there’s some evidence of what looks like tape drop-out), but are nevertheless welcome, and show that, at least, Pathé were making some effort. 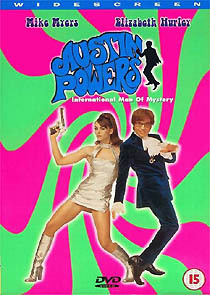 The company’s Austin Powers – International Man of Mystery disc had a tall order to measure up to New Line’s superb Region 1 disc, but they’ve succeeded, and have even managed to make the Region 2 disc an essential purchase for dedicated fans of the film who already have the US version. For a start the 16:9-enhanced UK disc is in a much wider ratio, (about 2.35:1 compared to the US disc’s 2:1), and is thus more representative of the theatrical presentation. (The film was shot in Super35, and the US disc adds picture information vertically – there’s actually less image on the UK disc. The director apparently prefers the slightly zoomed-in US transfer, incidentally, but it's not a true representation of the film's theatrical appearance). It features several scenes that weren’t incorporated into the American version of the film. Some of these were included as “deleted scenes” on the US disc, but a couple, involving a cameo appearance by Christian Slater as one of Doctor Evil’s guards, are exclusive to the British version. Most of the extra features on the Region 1 disc are also included on Pathé’s disc, including an amusing commentary track by star Michael Myers and director Jay Roach, the trailer and a couple of deleted scenes, including an alternate ending. The only omissions are minor, making the UK disc the one to go for.